First Prize winner of the 2008 Naumburg International Violoncello Competition, David Requiro has emerged as one of today’s finest American cellists. Mr. Requiro has appeared as soloist with the Tokyo Philharmonic, National Symphony Orchestra, Seattle Symphony, and numerous orchestras across North America. He has performed with the Chamber Music Society of Lincoln Center, Seattle Chamber Music Society, Jupiter Symphony Chamber Players, and is a founding member of the Baumer String Quartet. The Chamber Music Society of Lincoln Center recently appointed Mr. Requiro to its prestigious CMS Two residency beginning in 2018. In 2015, Mr. Requiro was appointed Assistant Professor at the University of Colorado Boulder and has previously served as Artist-in-Residence at the University of Puget Sound as well as Guest Lecturer at the University of Michigan. As part of Cello Month, The US Marketing Manager for Pirastro Strings Ed Mingo will be giving an in-depth talk on cello string construction and how to find your tone. The lecture will feature how the different core materials and metal windings affect the playability and projection of your instrument to help you create your own unique sound. As an added bonus everyone that attends the lecture will be entered for a chance to win a set of Perpetual Cello Strings. Join us for an evening of food, drink, and celebration of all things cello. 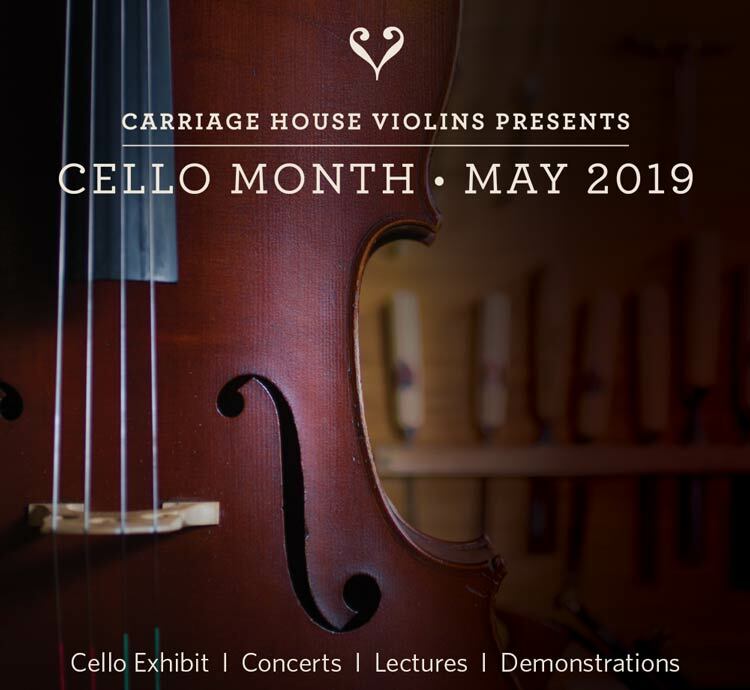 Browse our contemporary cello exhibit that includes a special group of modern Cremonese cellos from the Consortium of Violin makers “Antonio Stradivari” and mingle with fellow cellists and those who love the instrument. At age eleven, Ole Akahoshi was the youngest student to be accepted by Pierre Fournier. He received a bachelor from Juilliard and a master degree from Yale, where he studied with Aldo Parisot, as well as an artist diploma from Indiana University under Janos Starker. Mr. Akahoshi has served as teaching assistant for both Aldo Parisot and Janos Starker. Ole Akahoshi is the principal cellist of the Sejong Soloists. In 1997 he joined the faculty of the Yale School of Music, where he is Assistant Professor of Cello. Akahoshi enjoys a concert career in North and South Americas, Asia, and Europe in recitals, chamber music concerts, and as soloist with orchestras such as the Orchestra of St. Luke’s and Symphonisches Orchester Berlin. He has won numerous competitions, including Concertino Praga and Jugend Musiziert, and is a recipient of the Salon de Virtuosi fellowship award. His performances have been featured on CNN, NPR, WQXR, Korean Broadcasting, and the major German stations. Grammy-nominated cellist, conductor, and pedagogue Amit Peled enjoys a busy and dynamic career performing for audiences across the globe. Founder and Artistic Director of the Mount Vernon Virtuosi, Mr. Peled combines a growing conducting schedule, while continuing a thriving solo career performing on the historic 1733 Gofriller Pablo Casals cello personally handed to him by Marta Casals Istomin, and his professorship at the Peabody Institute at Johns Hopkins University. In his continued quest to make classical music more accessible, Mr. Peled recently published a children’s book A Cello Named Pablo and released a new cello technique method book The First Hour. Strasbourg-born cellist Blaise Déjardin was appointed principal cello of the Boston Symphony Orchestra by BSO Music Director Andris Nelsons in spring 2018, having joined the BSO’s cello section in 2008. Previously, Déjardin was a member of the European Union Youth Orchestra and the Gustav Mahler Jugendorchester. He was a founding member of the Boston-based string orchestra A Far Cry, and in 2010 he founded the acclaimed Boston Cello Quartet with three BSO colleagues. He has arranged numerous pieces for cello ensembles, earning four ASCAP Plus Awards and receiving commissions from Yo-Yo Ma, the Boston Symphony Orchestra, and A Far Cry. In 2013 he launched Opus Cello, his online sheet music publishing company. He has served as artistic director of the Boston Cello Society since its creation in 2015. Mr. Déjardin has performed as soloist with orchestra around the world. In 2008 he gave the U.S. premiere of French composer Edith Canat de Chizy’s Formes du vent for solo cello. A dedicated chamber musician, he spent two summers at Ravinia’s Steans Institute for Young Artists. He holds a first prize in Cello with highest honors from the Conservatoire National Supérieur de Musique of Paris, as well as a master of music diploma and a graduate diploma from the New England Conservatory in Boston. His main teachers were Philippe Muller, Laurence Lesser, and Bernard Greenhouse. Mr. Déjardin made his debut with orchestra at age fourteen performing Haydn’s C major concerto at the Corum in Montpellier, France. Among his numerous awards and honors, he was awarded first prize at the Maurice Gendron International Cello Competition and was also the youngest prizewinner at the 6th Adam International Cello Competition in New Zealand. In 2007 he made his Paris recital debut at Le Petit Palais as a laureate of the program Declic supporting emerging young soloists in France. He has taught privately and at the New England Conservatory and Tanglewood Music Center. A native of Seoul, Korea, cellist Kee-Hyun Kim is a founding member of the Grammy Award winning Parker Quartet. Mr. Kim started at the Juilliard pre-college in 1992. Since then, he has attended the preparatory divisions of the Korean National University of the Arts, where he studied with Myung-Wha Chung; the New England Conservatory, and the Walnut Hill School. He holds a B.M. from the New England Conservatory, as well as two M.M. from the same institution, where his principal teachers were Laurence Lesser and Paul Katz. A winner of numerous competitions both at home and abroad, Kee won top prizes in virtually all of the major competitions in Korea, including the Ehwa, Sae-gae, and Korean Newspaper Competitions, as well as placing second in the Pusan National Competition. He was the recipient of the Landgraf-von-Hessen Prize at the 1999 Kronberg Cello Masterclasses, and won second prize in the Hudson Valley String competition in 2002. As a member of the Parker Quartet, some awards and distinctions include 1st prize at the Bordeaux String Quartet competition, the Cleveland Quartet Award, and 2010’s Grammy Award for “Best Chamber Music Performance. Currently he is on the faculty of Harvard University’s Department of Music, where the quartet was appointed Blodgett Artists-in-Residence in 2014. Paul Katz is known to concertgoers the world over as cellist of the Cleveland Quartet, which, during an international career of 26 years, made more than 2,500 appearances on four continents. As a member of this celebrated ensemble from 1969 to 1995, Katz performed at the White House and on many television shows, including “CBS Sunday Morning,” NBC’s “Today Show,” “The Grammy Awards” (the first classical musicians to appear on that show), and in “In The Mainstream The Cleveland Quartet,” a one-hour documentary televised across the U.S. and Canada. Katz has received many honors, the most recent including the “Chevalier du Violoncelle,” awarded by the Eva Janzer Memorial Cello Center at Indiana University for distinguished achievements and contributions to the world of cello playing and teaching; The Richard M. Bogomolny National Service Award, Chamber Music America’s highest honor, awarded for a lifetime of distinguished service in the field of chamber music; an Honorary Doctorate of Musical Arts from Albright College; and the American String Teacher’s Association “Artist-Teacher of the Year 2003.” Katz is a passionate spokesperson for chamber music the world over and served for six years as President of Chamber Music America. As an author, he has appeared in numerous publications and wrote the liner notes for the Cleveland Quartet’s three-volume set of the complete Beethoven Quartets on RCA Red Seal. In 2011, declaring that “our art is passed from one generation to the next, not by books but by mentoring,” Katz launched CelloBello, a website designed to connect cellists of all ages and performance levels. Among the site’s resources are “Cello Lessons,” consisting of footage filmed in Katz’s studio with NEC students; “Legacy” videos from Katz’s own mentors; and a blog co-authored by more than a dozen prominent cellists. Through this medium, Katz is digitizing his own life experience as a student, teacher, and artist of his instrument. In September of 2001, Paul Katz joined the New England Conservatory faculty, following five years at Rice University in Houston, and twenty years of teaching at the Eastman School of Music. At NEC, in addition to his studio, seminar teaching and other chamber music coaching, and coaching the NEC Chamber Orchestra, he is founder of the Professional String Quartet Training Program. Join six of the fine cellists of the Boston Symphony Orchestra as they each perform one of the Bach Cellos Suites. Prior to the performance and during intermission brunch will be served to the attendees.